First part of a series on compiling information about Kurukshetra war as mentioned in the Mahabhārata. This three part article is a compilation of information on Kurukshetra war as mentioned in the Vyāsa Bhārata. The latter is considered a narrative of the events during the war since the author Sage Krishna Dwaipāyana Vyāsa, was a contemporary of the Pāndavās and Kauravās. Other references used are also mentioned along with some interesting information not directly connected with the war. Both Rāmāyanā and Mahābhāratā are mentioned as itihāsa (इतिहास) (translated as history but more precisely means creative rendering of historical narratives) and not as purāna (generally interpreted as mythology, but more correctly referring to creative narratives of events older than the narrator). Veda Vyāsā is traditionally considered to have written the purānā and Mahābhārata. He clearly distinguishes the two by calling the latter an ithihāsa, which in Sanskrit means history [ithi – it; hāsa – happened so]. Itihaasa thus refers to history and is also a very accurate word. Other words often listed as synonyms for itihaasa are also used in other contexts. Examples – caritra (चरित्र) can be used in other contexts (eg. character) and vṛttānta (वृत्तान्त) usually reporting one incident. However, there is no other meaning for itihaasa. It is used only in one context, that of history. On the other hand, purāṇa (पुराण), although understood as mythology, actually refers to ‘an event of the past, an ancient legend or old traditional history’. Every purāṇa would speak high of the personality central to the theme whereas itihaasa has no such compulsions. It would speak of things as they were. In Rāmāyana (रामायण), ayana means journey. Examples: dakṣiṇa ayana – Southern journey; uttara ayana – Northern journey; Rāma ayana – Rāma’s journey. The word ayana also implies some kind of returning path, as Rāma goes and returns. These are a form of conjunct words where the first word is a genitive form, so Raamaayana actually translates to Rāmasya ayanaH. Mahābhārata (महाभारत) refers to ‘narration relating to Bhārata’, ‘great history/legend of the descendants of Bharata’ and ‘great tale of Bharata dynasty’. Mahābhārata composed by Vyāsa was originally called Jaya (mentioned in the first verse). It is narrated by Vyāsa’s disciple sage Vaisampāyana to King Janamejaya, the great-grandson of Arjuna. The story is then recited again by the professional storyteller Ugrasrava to an assemblage of sages in the forest of Naimiṣāraṇyam. All these are mentioned in the Mahābhārata. Parallel sources such as the Brahmana texts also give list of kings mentioned in Mahābhārata. Notwithstanding the general understanding and interpretation, Rāmāyana and Mahābhārata are traditionally considered historical texts. The name of Veda Vyāsā, the composer of Mahābhārata, is Bādarāyanā (the one from Badari). He comes in the lineage of Brahmā, Sage Vasishta, Sage Shakti and Sage Parāshara. He was the great-grandson of Sage Vasishta (he therefore was also called Vāsishta, i.e. belonging to the family of Sage Vasishta), grandson of Sage Shakti and son of Sage Parāshara. He was also called Dwaipāyanā since he was born in a Dweep (island). He was referred as Krishna Dwaipāyanā because of his dark skin (Krishnā means black). This is intriguing since it is generally believed that the epics and Vedas were written by the ‘fair skinned’ Aryans. In this context, it is interesting to note that Vyāsā (considered an Aryan) was actually dark-skinned and addressed with a prefix ‘Krishnā’. He is, however, generally known as Vyāsā because of his monumental work in organising the Vedas, which till then existed as one, into four parts. Vyās, in Sanskrit literally means to arrange, to compile. Encyclopaedia Brittanica mentions of Vyāsā as having lived near the banks of river Saraswati. Mahābhāratā has 18 parts, 98 chapters, 2352 divisions and 96,635 slokās. It is said that Vyāsā originally wrote 60,00,000, i.e. 60 lakhs slokās. What has come down to us is about 1 lakh slokās only. Vyāsā taught Mahābhārata to Sukā, his son and some of his disciples, one of whom was Vaisampāyanā. When Janamejayā (great grandson of Arjunā) conducted a yajña, Vaisampāyanā narrated the Mahābhārata as told by Vyāsa. Ugrasrava (son of Romaharshanā, a disciple of Vyāsā) known as Sutā (referring to a professional storyteller) was also present at that time. He went to ‘Naimishāranya’ where there was a gathering of rishis (one of them was Saunakā) and there he told them the epic. It is mentioned that this is the place where Mahābhārata was first told in public and the version that has come down to us. Vyāsā gives extensive details of the army. Eighteen Akshouhinis (अक्षौहिणी) took part in the war, 11 on the side of the Kauravās and 7 on the side of Pāndavās. Table 1 outlines the make up of one Akshouhini. Considering the 18 akshouhinis involved in the war, a total of 3,93,660 chariots, 3,93,660 elephants, 11,80,980 horses and 19,68,300 foot soldiers had taken part. It is not clear if the count includes the 3,93,660 soldiers on the chariots, driving the chariots, and controlling the elephants and the 11,80,980 men on the horseback. If these numbers are also included, then the soldiers actually on the battlefield would be 43,30,260, i.e. about 4.3 million people. Not included also are the horses attached to each chariot. Some of the chariots were drawn by more than 1 horse. However, the minimum number of horses used for the chariots would be the number of chariots, i.e. 3,93,660. The total number of horses would therefore have been 15,74,640. Besides these active participants, there were others such as Vaidhiks (doctors), helpers (nurse-men), cooks, tailors, advisors, spies, men with knowledge of the art of warfare, messengers, etc., as part of the army. The importance of number 18 in Bhārata Varshā has been pointed out by many. The recurrence of number 18 in Mahābhāratā is also very interesting. Vyāsā wrote 18 Purānās. Mahābhāratā is divided in 18 Parvās (parts). The Gitā has 18 chapters. The Kurukshetrā war lasted for 18 days. The war in Rāmāyanā continued for 18 months and the war between the Devās and Asurās took 18 years. Bheeshmā teaches Yudhishthirā 18 different Raja Needhi (dharma) and so on. Interestingly, the number of Akshouhinis (army unit) that took part in the Kurukshetrā war was also 18. If all these numbers are added (i.e. make up of one Akshouhini) , i.e. 21870 + 21870 + 65610 + 109350, the resultant number 2,18,700 also displays the same feature, i.e. addition of the individual numbers (2+1+8+7+0+0=18) results in 18. Rathikā – fights with one charioteer at a time. (eg – Krupā, Dhurmugā, Vivimsathi, Uttamaujā and Uttrā). The countries/states mentioned in the Vyāsa Bhāratā to have taken part in the war are: Pānchālā*, Madrā*, Matsyā*, Sālvā, Videhā, Bāhlikā, Dhasārnā, Surasenā*, Kalingā*, Magadhā*, Vangā*, Angā*, Gāndhārā*, Kāmbojā*, Kosalā, Govāsanā, Trigarthā*, Mālwā*, Yavanā*, Chedhi*, Pāndyā, Cholā, Kekeyā*, Kāsi, Prāgjyothishā*, Avanthi*, Sindhu desh, Chinā, Mlechchhā*. Only 2 kings did not take part in the war from Bhārata Varshā – Krishnā’s brother Balarāmā and Rukmi (prince of Vidharba and a Bhojā king) brother of Krishnā’s wife Rukmini. All other kings from Bhārata Varshā are said to have taken part in the war. Most of the information given below are from Encyclopaedia Brittanica. The others indicated within paranthesis are from other sources. including districts of Peshawar (Peshawar was then known as Purushapura). Mālwā – likely that Southern Rajasthan as far as Narmada and Ujjain district was named/known as Malwa after the Mālavās, who appear to have migrated from Punjab to the Jaipur area around 58 BC. Trigarthās – associated with the Chambā region of the upper Rāvi River, but they also may have inhabited the area of Jālandhavā in the plains. Prāgjyotishā– modern Guwahati. 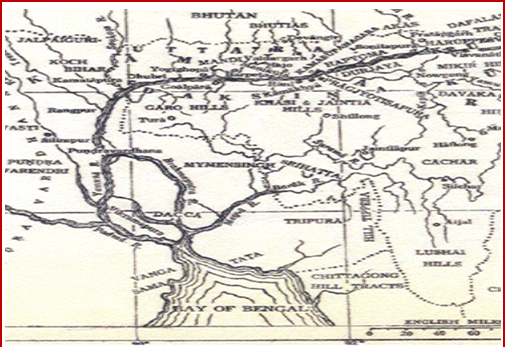 Ancient Kāmarupā (Assam) included roughly the Brahmaputra valley, Bhutan, Rangpur region (Bangladesh), Koch Bihar, West Bengal. King Narakāsurā and his descendant Bagadattā (who takes part in Kurukshetrā war) were famous rulers of Kāmarupā in Mahābhārathā period. Rangpur in North Western Bangladesh on Ghāgāt River mentioned as the country residence of Bagadattā (Map 2). Kāmbojā- adjoining Gandhārā. Later, it became a trading centre for horses imported from Central Asia. Angā – North of the delta. Political map of Prāgjyotishā-Kāmarupā, 400-1200 CE (http://www.cohums.ohio-state.edu/comp/maps.htm). The highlights are places mentioned in Mahābhārata. Bagadattā was the king of Prāgjyotishā and his country residence was in Rangpur (Encyclopaedia Brittanica). Buddhist writings and other sources on Pre-Mauryan states (500 – 150 BC) mention 16 major states dominating the Northern part of the sub-continent. Some of the states mentioned in the Mahābhāratā find mention. For instance, Gāndhārā, Kāmbojā, Kuru Pānchālā, Matsyā, Kāsi and Kosalā. These are continued from the earlier period and are also mentioned in Vedic literature. Other states are Avanti, Asvakā, Surasenā, Chedi, Mallā, Vrijji, Magadhā, Angā (Encyclopaedia Brittanica). Encyclopaedia Brittanica mentions a state called ‘Covasna’ in Hungary/Romania in olden times and Balikh around 2300 BC in old Mesopotamia. Their similarity to Govāsana and Bahlika mentioned in Mahabhārathā is interesting. 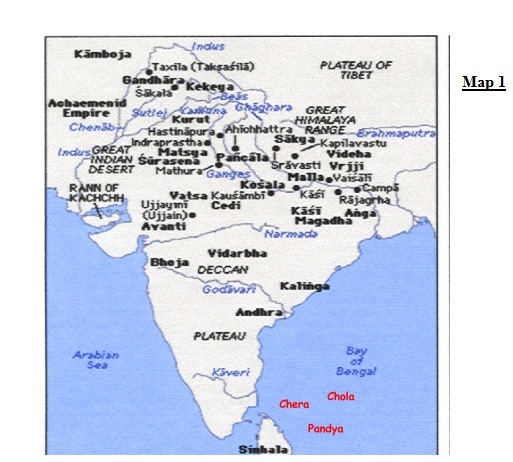 The above map-1 showing states in India around 500 BC is taken from Encyclopaedia Britannica. Some of the states mentioned in Mahābhārata can also be seen. The kingdoms of Cherā, Cholā and Pandyā have been shown additionally by the author. The 11 Akshouhinis were lead each by Krupā, Salyā, Jayadrathā, Sudhakshinā, Kruthavarmā, Ashvattāmā, Karnā, Bhurisravā, Sakuni, Bāhligā and Dronā. * the king who wanted to marry Ambā, the princess of Kāsi but was defeated by Bheeshmā and later refused to marry Ambā. The clans who took part in the war are Yavana, Saga, Bhoja, Nishada*, Mlechchha. * Nishada are supposed to be very short, black in complexion, very powerfully built and with red hair. They were hunters. Incidentally, Guha the character in Ramayana was a Nishada king. (7) Virātā of Matsyā kingdom. The 7 Akshouhinis were led by Drupadhā, Virātā, Drushtadhyumnā, Sikandi, Sātyaki, Chekidānā (Vrushni clan) and Drushtakethu. * Sātyaki was the grandson of King Shini who fought with Vāsudevā (Krishnā’s father) along with Sowmadattā during the Swayamvarā of Devaki (Krishnā’s mother). Bhurisravā who fought for the Kauravās is the grandson of Sowmadattā. * In addition, it is mentioned that the Cherā king supplied food to the entire army. Because of this he is known as ‘Perum Chotrudaya Udhayan’ meaning the Udhayan, who possessed large amounts of food. This is also mentioned in the old Tamil classic “Pura Nānuru”. Mention is made of the Cherā, Cholā and Pāndyā kings from Southern kingdoms as having attended with lots of gifts for the ‘Rājasuya Yāgā’ conducted by Yudhishthirā at Indraprasthā. While the Cherā and Cholā kings are said to have gifted lots of sandalwood and pearls, the Pāndyā king is said to have given 96 bārams of high quality sandalwood and 96 high quality conches. The clans mentioned are Nāgā*, Somagā. * Extracts from “Ancient Jaffna” by Mudaliyar C Rasanayagam (1926). – “In the Mahābhārata the Nāgās are frequently mentioned as living in various parts of India and Ceylon in a highly civilised state under their own kings. For example, Nagpur ( Nagapuram), Nagarjuna Hills, Nagarcoil, Nagarcot, Nagapattinum etc.” – from the Slab Inscription of Queen Lilavati by Mudaliyar C Rasanayagam, first Edition 1926 (http://ds.dial.pipex.com/ town/parade/nm58/rasa.htm). Nāgās were also considered to have inhabited the present Nagaland and Manipur areas. Note – Repetition of some names could refer to different kings with the same name. Similarly, more than one name from a kingdom could refer to kings from the smaller states within the kingdom. The author is in the Department of NMR, All India Institute of Medical Sciences, New Delhi.